Equally important, the actual level of business conditions rose to a 14-year high, which is a precursor to the publication of what is likely to be strong official GDP data over the next two quarters. These buoyant expectations fit with the recent analysis of the Reserve Bank, which forecast on-going solid rates of economic growth into 2019. This is the key reason the RBA is holding its stance the next move in interest rates is likely to be up rather than down. The sub-components of the business expectations survey were all positive. Most encouraging was a further rise in expected employment and a strong increase in expected capital expenditure. The run of official data on employment has been strong for around 18 months, in line with the results of the illion business expectations survey, and further gains in employment are likely in the coming months. The slump in private sector business investment has been an area of economic weakness in recent times. There is some evidence of a turning point in investment since late 2017, and the business expectations data suggests there should be a further lift in capital expenditure over the remainder of 2018. As has been the case for the past year, and an issue important for the RBA and interest rate risks, expected selling prices continued to increase. If these expectations for higher selling prices show up in higher official inflation in coming quarters, the RBA expectation for an interest rate hike will gain credence. 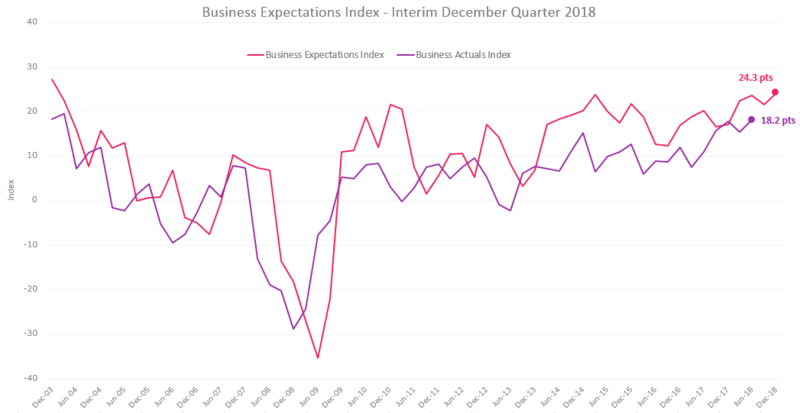 There is a risk that the current round of political uncertainty will undermine business expectations over the next few months. The history of the illion survey suggests that elections, particularly where there is a likely change of government, hurt business confidence. The next survey of business will be closely watched for any evidence of downside.